Chris going 152 MPH on Acela Express First Class. Chris has ridden over 1,312,000.0 miles - that's equal to over 54.66 times around the world! He has ridden trains in all 50 states and has traveled on every Amtrak route at least twice, plus all the trains of Canada's Via Rail as well as every intercity route in Canada. In Mexico he has done Copper Canyon many times plus some other special places. Here are a few of the milestones that Chris has done: He hit his 100,000th mile on the Ferrocarril Pacifico at Lujan, in the Mexican state of Sonora, he reached 250,000 miles on Amtrak train #580 near Irvine, California, and when he got to 500,000 miles he was on Amtrak train #11 at mile post 256.8 on the Union Pacific's Coast Line in California. On August 28, 2002 he passed 700,000 miles 14.1 miles west of Albuequerque, New Mexico. 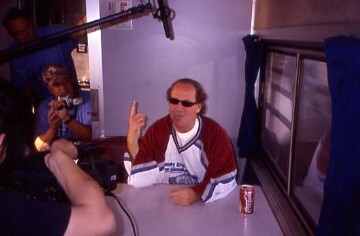 On May 26, 2003 at MP 178 east of Santa Ana he passed 750,000 rail miles. On April 25th,2004 he was on Train 4 and passed 800,000 miles just west of the Metrolink West Corona Station. On February 20th, 2005 he passed 850,000 miles at MP 215.6 on Surfliner 785 on the San Diego Sub. 900,000 miles was passed aboard the Southwest Chief Train 4 on the BNSF Seligam Sub at MP 369.9. On November 26th, 2005. 950,000.0 miles was passed at MP 200.9 on the Metrolink San Diego Sub on 8/29/06. On April 27, 2007 at MP 425.5 at the Missouri River Bridge at Sibley Missouri aboard the Southwest Chief, Chris passed his One Millionth Rail Mile ridden. 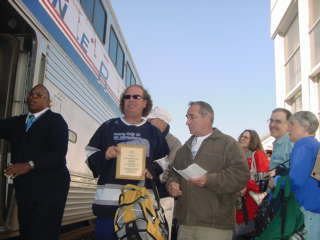 On April 7, 2008 as Chris stepped off the Southwest Chief at the La Plata, Missouri Amtrak Station he reached his One Millionth Amtrak Mile ridden! 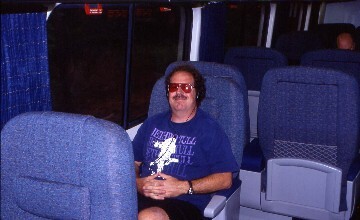 On September 7, 2008 Chris passed his 1,100,000.0 Rail Mile on Surfliner 571 passing under Interstate 5 west of Irvine at MP 183.2 on the Metrolink San Diego Sub. On December 16, 2009 he reached his 2,000,000.0 Kilomoter as well as his 1,200,000.0 Rail Mile at Milepost 166.2 on the Metrolink San Diego Sub at the Orangethrope Grade Crossing in Anaheim. On July 1, 2010 Chris passed his 1,250,000.0 Rail Mile 2.7 miles west of WB Jct at MP at Milepost 391.4 of the BNSF Marceline Sub in Missouri. On May 19, 2011 at MP 282.5 on the CSX Mohawk Sub which is 2.5 miles west of Kirksville, New York he passed his1,300,000.0 Rail Mile. Got any rail travel questions for Chris? Contact him at: e-mail me. Chris reached his Millionth Amtrak Rail Mile.Click here for the story. Read about my trips in 2006 through 2011. Read about my trips from 1980 though 2005.